Work force (2004): 24,720,000: Services�72.9%; industry and commerce�24.4%; agriculture�2.7%. Seven years later, in an occasion marking the first time in the 20th century that the people of France went to the polls to elect a president by direct ballot, de Gaulle won re-election with a 55% share of the vote, defeating Fran�ois Mitterrand. In April 1969, President de Gaulle's government conducted a national referendum on the creation of 21 regions with limited political powers. The government's proposals were defeated, and de Gaulle subsequently resigned. Succeeding him as president of France have been Gaullist Georges Pompidou (1969-74), Independent Republican Valery Giscard d'Estaing (1974-81), Socialist Fran�ois Mitterrand (1981-95), and neo-Gaullist Jacques Chirac (first elected in spring 1995 and reelected in 2002). President Jacques Chirac and his center-right coalition won the May 2002 elections. Chirac was first elected in 1995, and his party, the Rally for the Republic (RPR), won an absolute majority in the National Assembly. In Chirac's first term, a referendum was passed changing the presidential term of office from 7 to 5 years. During his first 2 years in office, President Chirac's Prime Minister was Alain Jupp�, who also served as leader of Chirac's neo-Gaullist RPR Party. However, during the legislative elections of 1997, the left won a majority in the Assembly, and Jupp� was replaced by Socialist Lionel Jospin. This right-left "cohabitation" arrangement, which ended with Jospin's resignation following his defeat in the first round of the May 2002 presidential elections, was the longest lasting government in the history of the Fifth Republic. Jean-Pierre Raffarin became Prime Minister in May 2002 following Jospin�s resignation. In June 2005, former Interior Minister Dominique de Villepin replaced Raffarin as Prime Minister, shortly after the defeat of the EU Constitution in a referendum on May 29, 2005. Among other cabinet changes in June 2005, Phillippe Douste-Blazy became the new Foreign Minister and Nicolas Sarkozy was appointed Interior Minister. The ensuing legislative elections proved to be a victory for the center-right and a reversal of the 1997 elections. The center-right coalition party won 399 out of 577 seats in the National Assembly, thereby securing for Chirac and his party a majority in the government. Meanwhile, the combined left--Socialists (PS), Communists (PCF) and Greens--took only 178. The extreme-right National Front, despite the infamous second-place finish of its leader Le Pen in the April/May 2002 presidential election, won no seats. Abstention at 39% set a new record. In March 2004 regional elections, however, Chirac�s party lost control of all but one region, while the Socialists scored major gains. The Union for Popular Movement (UMP)--center-right coalition party--won only 16.6% of the vote in the June 2004 European Parliament elections. Experts have called on France to reduce government spending, the budget deficit, and public debt, and to allow flexibility in the implementation of the 35-hour work week. Mounting pressure for short- and long-term reforms include more labor-market flexibility, less taxation, and an improved business climate, including further privatization and liberalization. French and EU analysts stress that longer-term measures must focus on reducing the future burden of ballooning public pension and health care budgets, as well as reducing labor-related taxes. Government action to initiate such reforms may have contributed to the center-right�s poor showing in the 2004 regional and European Parliamentary elections, and continues to spark periodic strikes and work stoppages throughout France. France places a high priority on arms control and non-proliferation. After conducting a final series of six nuclear tests, the French signed the Comprehensive Test Ban Treaty in 1996. France has implemented a moratorium on the production, export, and use of anti-personnel landmines and supports negotiations leading toward a universal ban. 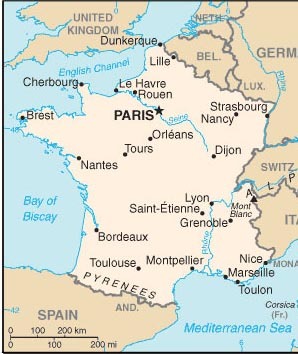 France is an active participant in the major supplier regimes designed to restrict transfer of technologies that could lead to proliferation of weapons of mass destruction: the Nuclear Suppliers Group, the Australia Group (for chemical and biological weapons), the Non-Proliferation Treaty, and the Missile Technology Control Regime. France participates actively in the Proliferation Security Initiative, and is engaged with the U.S., both bilaterally and at the International Atomic Energy Agency (IAEA) and Organization for the Prohibition of Chemical Weapons (OPCW), to curb nuclear, biological, and chemical (NBC) proliferation from the D.P.R.K., Iran, Libya, and elsewhere. France has signed and ratified the Chemical Weapons Convention.